This article comes to us today from the Associated Press. In it, author Ray Henry appears to try to get us to think that standardized plant designs are a somewhat new thing. What's really happening with this and other similar articles is that authors and reporters are re-educating themselves in atomic energy, and catching up on many years worth of having ignored or belittled news and developments from both pro-nuclear people and the industry itself (meaning both vendors and utilities.) Henry even admits that the idea for standardized plants isn't new and says that it dates back to the 80's. 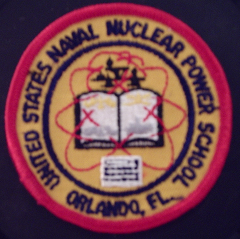 Actually, it dates to the 50's with both common standard training reactors built all over the US and in fact the world by a number of vendors, and standard military plant designs developed and built primarily for the Navy, but also in a small number for the Army. 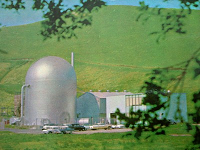 The training reactors had to be safe and reliable, and of course the military reactors had to be those things plus a large number of other things, and so standardized design cut risk, design time, and some development cost even though in the case of military plants the cost in dollars per MW output was incredibly high compared with any other range. In fact, for many years, all of our submarines of all types being built (585 class, 594 class, 637 class attack submarines as well as all classes of ballistic missile submarines) were powered by essentially the same power plant (Westinghouse S5W) with modifications and improvements over the years. Again, some mention is made (and - what a surprise - within the first thirteen lines of text) of the TMI-2 accident in 1979. Mr. Henry; of COURSE the industry learned from this accident. Let's not be ridiculous now. And, Mr. Henry, you describe the TMI-2 accident as a "disaster." How many people were killed? How many animals, how much livestock? How many acres of crops were contaminated and unfarmed thereafter? How much of the ecosystem was impacted by release of radioactivity into non-plant areas? Answers: None; none; none; none. That's not a disaster. Major nuclear plant accident? Yes. One that was contained adequately by the designed containment structure and primary plant. But, enough bashing Mr. Henry; he's obviously been colored by a few decades of complete misinformation. What is of interest to me is that today's nuclear renaissance is featuring essentially conventional PWR and BWR plants; there was a time after TMI-2 that various sources were indicating that only 'inherently safe,' radical new designs could possibly be acceptable to restart our nuclear industry (see "The Second Nuclear Era," a fabulous book long out of print and hard to find but in the APRA collection and well read.) Now it's all too clear that conventional plant designs, with safety updates above and beyond those in place in 1979 are very adequate and in fact are the basis for this renaissance. This knowledge, and the wind of public opinion, mean that the time is right not to take advantage of standardized design but to realize that standardized design in nuclear plants has been employed and working fine for 50 years. It's time to get moving, as I keep saying -- and it seems that every day we are, a little more.. at least as fast as bureaucracy allows. If you ask most people on the street, you'll find that there's a general opinion that fusion power is possible if we throw enough money at it. 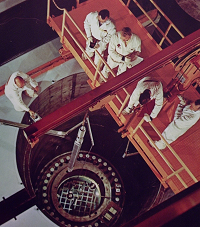 Many still believe "cold fusion" worked but was killed off, somehow, by the government. Or big oil. Now, if you ask most scientists you'll get a much more educated and conditioned answer and usually it'll include the tag line "we're still about twenty or twenty-five years from being able to achieve this," whatever this it was that was being described. That was the same thing they were saying in the late 50's during Project Sherwood, which was the AEC program to develop fusion energy. Now, it appears that Iranian know-how has pushed that time gap down to a very manageable ONE DECADE time frame! This article and a number of others are detailing the Iranian assertion that they'll have a fusion reactor in 2020. Iran just started fueling its first commercial atomic power station this last week. Comanche 3 & 4 .. ? I've just finished reading this article, which seems to me to be a very well-balanced piece on the future plans for additional units at Comanche Peak Steam Electric Station, in Texas. A good if brief background on construction of Units 1 & 2 is given; both are Westinghouse 4-loop plants (PWR) with Unit 1 rated 3612 MWt / 1200 MWe and Unit 2 rated 3458 MWt / 1150 MWe. Units 3 and 4 are to be Mitsubishi Advanced PWR plants rated over 4400 MWt each. Incidentally, two new (replacement) steam generators, built in Japan by Mitsubishi, were just delivered for installation at San Onofre 3 in California. See them here. TVA to dust off Bellefonte? Two unfinished BW-205 plants are located at TVA's Bellefonte Nuclear Station in Alabama, and every once in a while the idea of restarting construction (which went for 12 years and then stopped) comes up. Now, TVA has budgeted for exactly this at Unit 1, at least, and it appears this project might have legs. Look here for a few details. This is made all the more interesting when you consider that, back in 2007, TVA applied to the NRC to get a project going to build Unit 3 and 4 at this same site, which are to be Westinghouse AP1000 plants. One wonders if this new announcement won't scuttle that plan. ILLINOIS: The Zion generating station decommissioning and dismantling took a major step as ownership of the license for the site will be transferred from Exelon Nuclear to a firm that will perform the whole operation all the way down to having the site released for public use. Look here for a brief description of the upcoming legal and licensing events. The Christian Science Monitor recently ran this article that is a fair summing up of the growing public and industry viewpoints on nuclear -- stopped too soon, not enough work done in the doldrums, too slow to restart now, not enough funding or enough initiative. It's worth reading as a "finger on the pulse" piece. The outage at Crystal River continues... Originally planned as a steam generator replacement but now into a partial rebuilding of the containment. This article gives a good overview of where the project is right now. Crystal River 3 is a Babcock & Wilcox PWR rated 2609 MWt / 838 MWe. Construction of the plant began in late 1968 and the plant was ready for commercial service in early 1977. The plant is No. 3 because there are four other plants at the site, all fossil fueled, numbered 1, 2, and 4. There have been, and are, a number of other plant sites like this such as Robinson and LaCrosse where fossil plants and nuclear plants are side by side. Although the previous post about the GOP candidate support for nuclear energy must be good news for Southern Company, this article shows that there is some bad news. Since one of the contractors didn't provide the proper questionnaire for construction employees, and then, when it did, had the unfortunate but totally avoidable mistake occur wherein a supervisor "filled out" the forms for some employees, the NRC has decided to pay a visit. This isn't the way to start off the first nuclear plant construction in almost a generation. Let's hope that this little hiccup is quickly put behind and that the two AP1000 plants go up. This article reports that both of the Republican Party candidates in the running to become Governor of the state of Georgia are decidedly in favor of nuclear energy, and thus are behind the plan to get two Westinghouse AP1000 plants added to the Vogtle site. We're sure that Southern Co. won't mind reading this! Five or six sources reported this afternoon (probably more now) that PSEG had filed with the NRC an application for an Early Site Permit to add a fourth reactor plant to its Salem / Hope Creek plants. The new plant is expected to be built by Hope Creek. 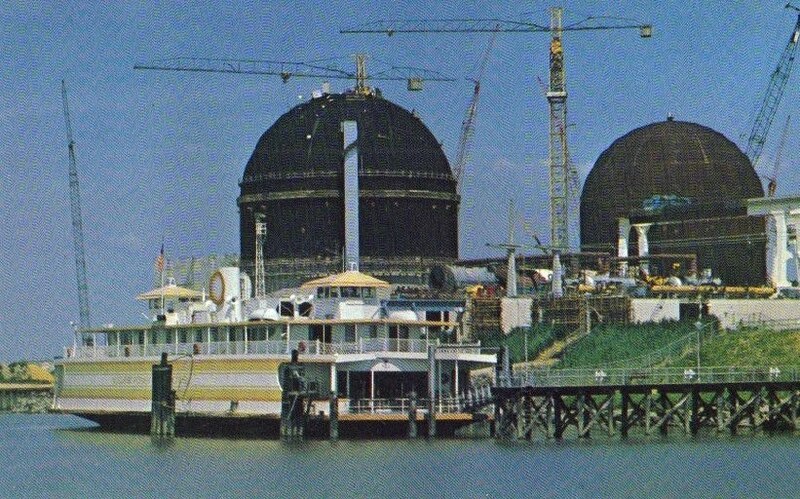 Shown here in front of Salem Nuclear Generating Station's two CE PWR plants under construction is THE SECOND SUN, which was a floating public information center designed to allow the public, free of charge, to learn about nuclear energy. Many plants had such centers, actually, which isn't common knowledge today but we're not aware of any other that was made from a converted river boat like this! This article gives details on not only the ESP that PSEG filed for but history of the whole Salem / Hope Creek plant sites, in very brief but decent detail for review. 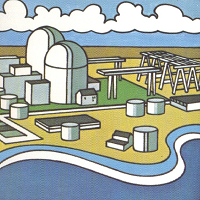 Postcard of Salem Nuclear Generating Station and 'The Second Sun' from APRA collection. We aren't here today to give a monograph presentation on SNPF, though; we're here to provide a link to an excellent page by GTS Technologies on their part in the DECON stage of the SNPF's life. Click here to see it and be sure to click on the link at the bottom for some very interesting photos that give a much better appreciation for the engineering and work required to get this project done. I note that while there was some buzz generated by the July 28 announcement that Babcock & Wilcox is going to construct a test facility for the new joint B&W / Bechtel modular reactor plant "mPower" concept, the actual test equipment will both be scaled down from actual size and will NOT be nuclear powered. Rather, the facility will use electric heat to simulate the nuclear primary heat, and will prove out the overall generation package. Now, getting away from the news to opinion, I wonder to myself... "WHY?" 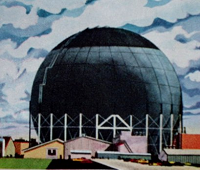 Do we need to reinvent all of the technology and relearn the experience with modular plants that started with ALCO Products and Fort Belvoir, and with Argonne National Laboratory and its various projects, and ML-1 and on and on? No. Let's move forward faster, I say. For completeness, we report that today's NRC status shows Surry and North Anna plants back at 100% PRx. This should complete previous information on this site about plants down. PR Newswire is reporting today that the river water problem at Susquehanna 1 is corrected and that the plant is back on line. Today's NRC status for Susquehanna 1 showed 16% PRx.